A deaf child was born to an all-hearing family. got advise from pro-CI and anti-CI groups. a decision was made not to implant the child. deaf – without using sign language. Just face the deaf person directly. scared and impatient hearing people! Tan Teck Sum, not deaf, is a sign language instructor. the state has not done anything. rewarding than teaching students face to face. DNA testing? This is a personal decision. just two in the entire USA! most influential disabled person in Great Britain. 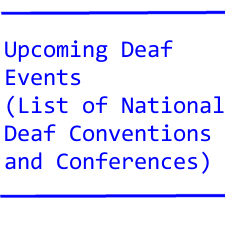 Who is the most influential deaf person in USA? Marlee Matlin, Nyle DiMarco, who else? gas, water, sewage, telephone and transportation. would a deaf club serve a hearing community? and hearing groups to host their own events. deaf community AND hearing community.